Our family of gourmet foods is growing! 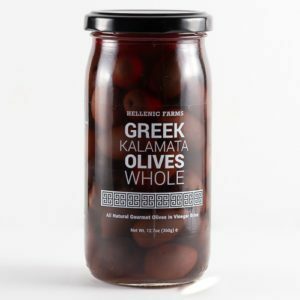 We are so excited to welcome several unique and flavorful products from Hellenic Farms to our pantry of already delicious gourmet foods. This week we are featuring select and unique sweets & snacks including Greek Olives, Roasted Red Peppers, Pickled Vegetables, and Vegan Fig Salami. 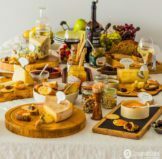 Purveyors of the finest Greek gourmet foods, Hellenic Farms is a premier importer and supplier of premium food products from all over Greece. 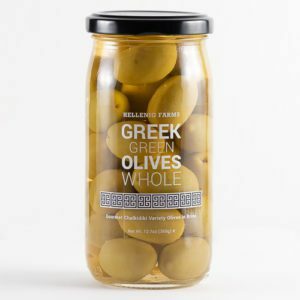 As a 100% woman owned business, Hellenic Farms prides themselves on their ability to source products that are unique, chic and freshly grown, reared, and produced in accordance with old Greek traditions. Vegan Fig Salamis are quickly becoming a favorite for our customers, and us too! 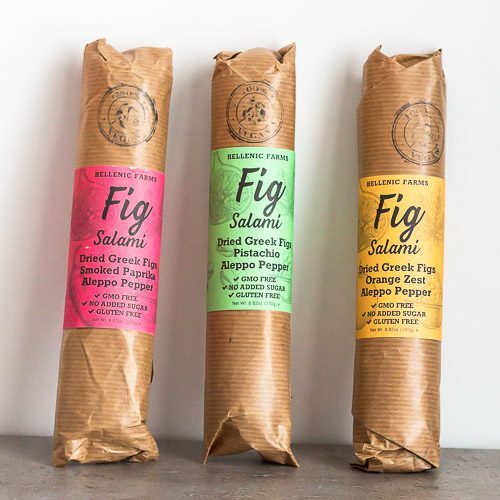 Each variety of Fig Salami is made from 100% Greek, premium figs, Aleppo pepper or cinnamon and dried fruits or nuts. These healthy snacks from Hellenic Farms make the perfect cheese companion on your charcuterie platter. Vegan Fig Salamis are GMO free and have no added sugars. 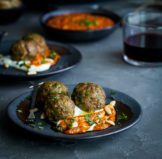 In a nutshell, they are truly a healthy and delicious alternative to fatty salamis. Let us know which one is your favorite! If you don’t know which to choose, you can try all three in the Vegan Fig Salami Variety Pack. You don’t need to be vegan to fall in love with them. I promise. Hellenic Farms also brings a variety of Kalamata & Chalkidiki olives to our sweets & snacks section of our pantry. 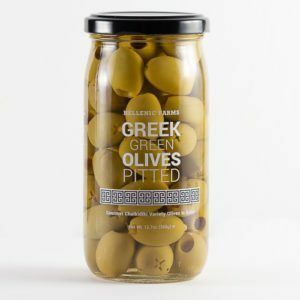 The Kalamata Olives, which are available both pitted and unpitted (whole), are all-natural, gourmet olives that are harvested by hand in late fall and naturally cured to keep their exceptional taste and premium quality. 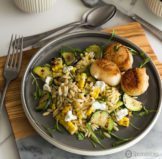 We love serving them with fresh feta cheese for a truly gourmet (and very quick & easy) appetizer. The Chalkidiki Olive variety are extra jumbo green olives, both with pit (whole) and pitted. 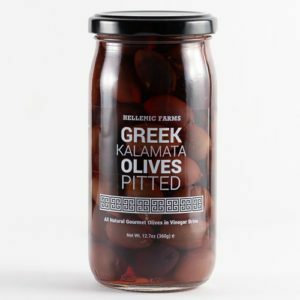 These premium quality olives come from olive groves in Northern Greece. They are firm in texture and mild in flavor. You will want this olive (or two) garnished on your next martini (or two). Trust me. 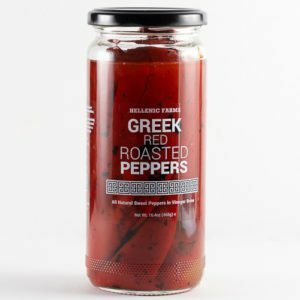 Greek Roasted Red Peppers: These authentic and delicious Greek Roasted Red Peppers from Hellenic Farms are all-natural sweet peppers in a pleasant vinegar brine. Grown in fields of Northern Greece and following a centuries-old tradition, the peppers are harvested by hand under the abundant Mediterranean sun and picked at peak ripeness. They are immediately fire roasted to preserve their high nutritional value. We enjoy them just as they are, as well as in salsas, dips, and as garnishes. I can’t get enough of them. 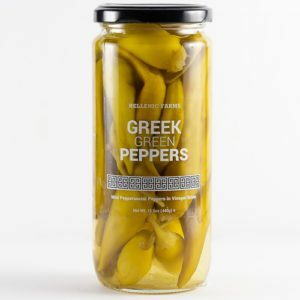 Greek Green Peppers: These superior quality pepperoncini peppers are prepared in a vinegar brine. The mild peppers are grown in fields of Northern Greece where they are exposed to an abundance of sunshine. We love to use them for sandwiches, in salads, with grains, in salsas and so much more! Our Garden Salad Pickled Vegetables: This exquisite, pickled salad is packed with an abundance of vegetables from a typical Greek country garden. Try using a jar of Our Garden Salad Pickled Vegetables in your next Greek pasta salad. Everyone will be wanting more! I always do! Stay tuned for Hellenic Farms Greek Spreads and Olive Combos! Next, Carlos and I will be introducing a few Greek spreads and mixed olive combinations. 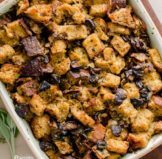 Believe it or not, the holidays are coming, and you want to make sure your holiday parties have the best quality items on your appetizer board. 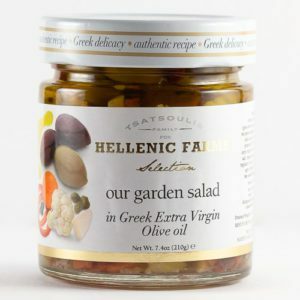 We hope you enjoyed learning about Hellenic Farms and our newest pantry items and hope you add them to your pantry too.